Sometimes it is desired to repeat a record multiple times in a query. Perhaps the query is a recordsource for a report that is printing mailing labels where some duplication of labels is needed. One technique to do this is to have a table that specifies the number of repeats needed. This table is then joined to a simple table holding sequential numbers. 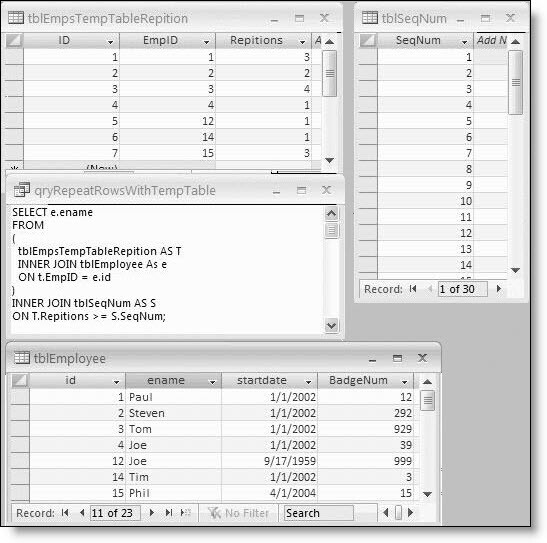 The image below outlines the table and working query. Just a quick note on temporary table use in Access before I leave this snippet. Creating and deleting tables in a production environment Access application can cause the .accdb/.accde/.mdb/.mde file size to swell. Compacting the database returns the file size to something closer to deployment size. A nice alternative is to create your temporary tables outside your application in a temporary Access file. See the details on Tony Toews’ valuable Access site.